Let the dance of life begin: WE RALLAAAAY!!!! 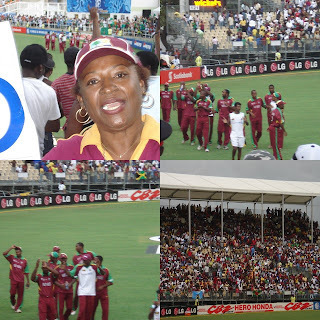 Well I 'caught' the last part of the match at the yesterday, Windies/Ireland. Sabina was vibed up I had a blast, and I was not going to head down there finished my presentation late, traffic was rough but just proves sometimes less planning means more fun(: Di Windies won the match by 8 wickets and Chanderpaul made a century. So lets just say the walk to Sabina was worth it!!!!! (di moms, di boys and we di crowd). We rally now and foreva!! !